One week it’s Laguna Seca, the next it’s the Hockenheimring. After competing in the IMSA WeatherTech Sportscar Championship a fortnight ago, Dominik Baumann returned to Germany to race on one of the most famous tracks in the world last weekend. The occasion was the grand finale of the 2018 ADAC GT Masters in which he shared the cockpit of a Mercedes-AMG GT3 with AutoArenA Motorsport driver Patrick Assenheimer. In terms of points scored, the guest appearance in the Super Sports Car League proved to be well worthwhile. Friday’s two free practice sessions were an opportunity for Baumann to reacquaint himself with a GT3 car which he had last driven in the 24-hour race at the Nürburgring in May. With the weather conditions varying throughout the day, he was able to drive the 550bhp car in both the wet and the dry. Getting back into the swing of things was not a problem, as became apparent when the race weekend began in earnest. Starting from 23rd in a field of 34 super sports cars, Assenheimer and Baumann mounted an impressive charge through the field in the first race on Saturday. An impeccable performance by the two drivers as well as the entire team resulted in a P10 finish, securing the duo a championship point on their first joint outing. 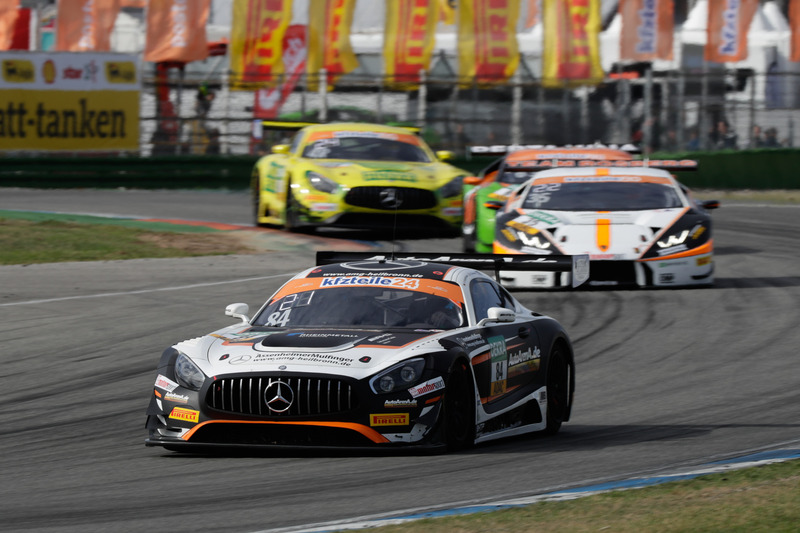 They also made a podium appearance for having finished third in the Junior classification, which Assenheimer competes in as one of AutoArenA Motorsport’s regular drivers. By contrast, Sunday brought no tangible rewards. A miscalculation in timing Baumann’s final run frustrated the attempt to secure what might otherwise have been a respectable grid position. On a drying track, the Austrian was one of the first drivers to run out of time. So from looking all set for a start in the Top Ten, he found himself in a relatively lowly P17. In the race itself, Baumann battled through to tenth place in the first stint. A defective wheel nut impeded the progress of his team-mate in the second half of the race, and they were ultimately obliged to settle for a P13 finish. The curtain has now fallen on the 2018 ADAC GT Masters at Hockenheim, but for Baumann, it will be business as usual on 30th September. The 25-year-old travels to Barcelona where he will drive an Aston Martin V12 Vantage GT3 for R-Motorsport in the Blancpain GT Series Endurance Cup. And on 13th October, he will be back in the USA competing in the Petit Le Mans on the penultimate race weekend of the IMSA WeatherTech Sportscar Championship. Dominik Baumann is back in the ADAC GT Masters. How did your guest appearance at Hockenheim come about? It was all quite unplanned. AutoArenA Motorsport were looking for a stand-in because two of their three regular drivers, Raffaele Marciello and Maro Engel, had other commitments. They contacted me via AMG, so we briefly met up in the week before the race and made the necessary arrangements. Everything immediately slotted into place. It went well from the start. In free practice, it was about getting used to the Mercedes again and also remembering that we’re not allowed to use tyre warmers in the GT Masters. In the race, Patrick gained some positions and handed the car over to me in 15th place. We executed a perfect pit stop, which was only three tenths over the minimum time permissible. I then overtook several opponents. We eventually finished tenth and even made a podium appearance for third place in the Junior classification. I hadn’t seen that coming, but I’m quite happy to be part of a success story like that. However, it was also a tough race: as you would expect from the ADAC GT Masters, we were fighting for every tenth of a second. Sunday could have gone even better, but you were out of luck this time. What happened there? Qualifying was really unfortunate for us. It was wet at first, and when it dried, we switched to slicks. From that point onwards, we were close to qualifying in the Top Three, but then we crossed the line too late to put in one final hot lap. It’s small details like this that end up with you being way down in 17th on the grid. In the race itself, things improved. I made good progress and also avoided getting caught up in the chaos at the start. There were some great battles for position, but as result, we lost the connection to the front-runners. After the change of drivers, we were running tenth, but Patrick then had a problem and fell back to 13th. All in all, though, it was a good weekend. We put in a strong performance. After Hockenheim, you’ve got two more races to prepare for – and two different cars. Exactly. Next weekend, I’ll be driving for R-Motorsport in the grand finale of the Blancpain GT Series Endurance Cup. I’m looking forward to the race. The track was resurfaced earlier this year and should suit the Aston Martin. Over a race distance of three hours, I really rate our chances. We were also competitive in the 24-hour race at Spa-Francorchamps. We have a strong driver pairing and an extremely well-prepared car. Two weeks later, I’ll be back at Road Atlanta driving a Lexus RC F GT3 for 3GT Racing.